After a visit today, it seems that he now has a Disc Problem, in the lower lumbar region. This may heal medically and it may not. About 80% of the time it will. If it doesn't, we MRI and go from there. He is now on complete "Bed Rest" This means no playing, running, no off leash, on meds, only walking when needed, the remainder of the time lying DOWN and resting. For at least two weeks. Walk in the park, really. Or not, as the case may be. Not sure how I am going to explain this to him, he isn't getting it. You can't SAY "Look Doofus, what I wouldn't give for two weeks in bed, will you just lie DOWN??" If I am near him, he will be content and lie down, and so, I will be near him, except for working out, and visits to Bengals, when someone else will need to be. I expect to be getting to know my Wee Laptop much better in the next few weeks. Poor guy. I do feel for him, as it really doesn't seem fair, what he's been thru in the last few months. We have no idea what caused the disc trouble. May have been ongoing, like his neck and leg, for some years. He's on meds, and not in pain, tho, and I will take care of him. 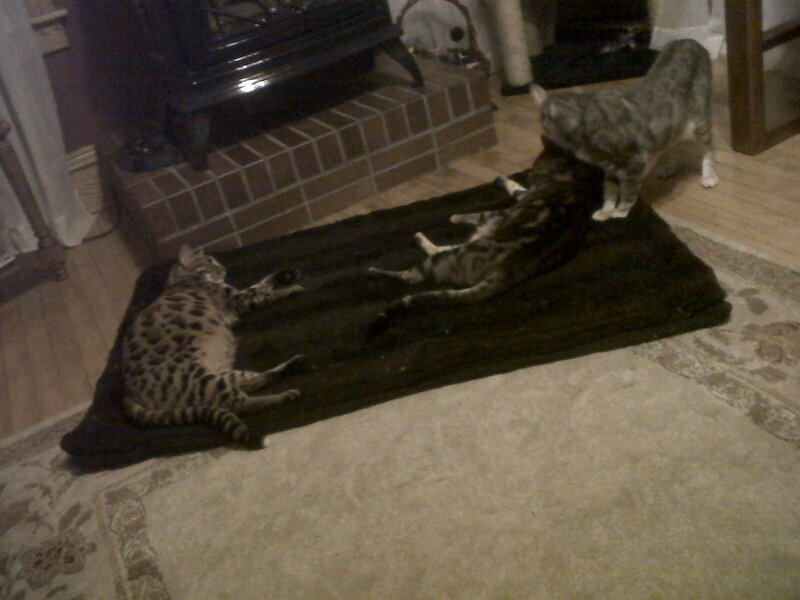 Here's some Bengals lying on their Real Faux Fur Rug, in front of the fire, last night. All three of them. I have a feeling this is going to be THE popular spot this winter! And yes, I do know Magic looks like a Pudding, there on the left, but here's some good news: He's started running on the Cat Wheel! Caught him on it, on the sly the other day. We will get video! I had a German Shepherd who developed disc problems -- and hip displacer. The vet gave him shots of Glucosamine weekly, for a few weeks, and it helped him immensely. I am not sure if this will help Cabal, but you might want to mention it. It couldn't hurt. Oh no, poor Cabal. Good luck with the getting him to stay quiet, hopefully the meds will help. Our guys send him soothing nose licks. Yay for magic on the wheel though! Amazing! I wish I could take a couple of weeks vacation and just hang out and nap with him. It might be good for both of us. Poor sweetie, give him a scruff behind the ears for me. I would have to agree with Ali. We also had a Shepherd who had displasia. I would also think that a possible lyme disease infection caused by the bite of the deer tick would be another guess (as suggested by the quite taciturn Vampi). I wish Cabal a quick recovery. ach, teh puir wee beastie. er, or not so wee. Poor Cabal, my heart goes out to him. He so loves to run and play! And of course, Lola won't understand any more than he will that her companion can't play with her. It's great to see all three Bengals sharing a lounging place. Has Venus stopped thinking Magic was mud? I hope the bed rest works. Good to see the Bengals together ( who knows, one day there may be a heap of 5) And great to hear Magic ismcat-wheeling - sounds like he has learned to relax and enjoy himself. 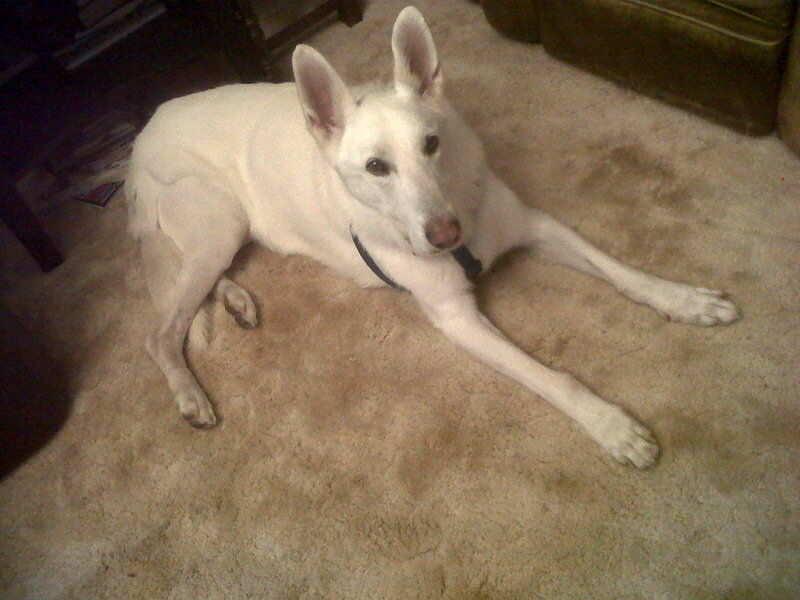 Grendel has hip dysplasia - glucosamine, arthritis drugs and low-dose anti-inflamatories keep it at bay. Here's hoping that Cabal's latest problems can be so easily treated. I think all of us want to take a two week vacation and sit with the puppy! I would LOVE it if you all wanted to take a two week vacation and sit with the puppy! I could SO use the help! Let me tell you all about what I stepped in last night tho. LOLA!!!!! She usually wakes me, nada, zip, nothing but dog , well, the not solid kind. I tracked it everywhere. Merry Housekeeper is going to be sad, tho I tried to clean it up. Poor puppy! He's probably thinking "I'm tired of resting, I want to RUN". Bad Lola!! I wonder if she's sick, though, if she's not potty-accident prone. My new walker is here, I need to make a fabric underseat basket because it won't fold up with the wire basket in place. It's also red, not blue. Hugs and scritches for Cabal! Poor Cabal. Adding to the hopes that he recovers soon. I wonder if Lola is upset about Cabal and showing you in her own way. Hugs and or gentle scritches for all of you. And more hugs for Vampi. Poor sweet doggie. I know it is stressful for you all, but all I can think is how lucky he is to have you all. If he was still on that farm, he might not even be alive anymore. And I would totally want that spot over the winter too. Have you tried crating him to keep him still? Many dogs take well to crates. They seem to think of them as their dens. Also - concur about the kong. A quarter teaspoon of peanut butter smeared on the inside will keep him busy for a long time. Well, problem is, he can't turn around in his crate. Or back in or out. I'm just staying with him, put a gate on the office door, and evenings stay in the living room. He won't go far from me. Makes getting up and doing things hard, I try and get myself set up and STAY places. He got a ramp today tho, Hans built him one, which is wonderful. He can now get in and out without DOOM. On a good note, I rode really nicely this morning. I feel like I am, if not exactly ready for my show Saturday, at least compendent. I won't embarrass us! I did ride well. I am getting stronger. Poor dear Cabal. So good he has such caring humans in his life! Hugs for Vampi -- it is so so hard but I am glad you could be with your family. Busy looking for "real" work while doing freelance work here and there. Has me feeling generally discombobulated. Yay for Good Riding Day Q! You'll learn so much from Saturday I am sure. I'm looking forward to your show, Lorraine. And yay for finishing homework. WHO HEARS ME? Raise the roof! My gmail was hacked. That's why I've been having email problems. Also, I got your email Marjorie, so you don't have to worry. I replied to folks on twitter but just wanted to say as far as I know, no fiends are anywhere near the huge San Bruno explosion. What a nightmare. I have friends a few miles from there. I've never been so happy to hear someone answer the phone. I woke up this morning & heard about the San Bruno fires; so glad to hear all Fiends in that area are safe. It sounds horrific. Wendy, thanks, & I hope your getting hacked didn't cause you too many problems. I am currently at the U of M vet with Cabal. His condition got much worse this morning. He could walk a little when I got up, but kept falling over, and by the time I had reached the vet, and agreed he should come in, he could no longer walk. Poor guy. Seems REALLY unfair. Oh, how horrid. Hugs and scritches all around, and I do so hope that everything comes out all right. Oh NO! My thoughts are with you. I hope they can save him. Pretty scary stuff. I REALLY REALLY don't want to have to give Boss Bad News via SKype. I let him know what is going on. Still waiting in the ER. Cabal is calmer and lying on my feet. Scary indeed. But anything love can do is being done! Waiting to see if the MRI machine is available today. We need to find out of it is disc or what exactly. Part of me is not liking the Dr's today. Not sure why they are asking ME what I want to do. What part of "DO whatever is needed for this dog" didn't they GET? He can't walk. He falls over. This is NOT GOOD DOGNESS. Sounds like surgery, if it is a disc..Might not be a disk. Such joy here today. I want my dog to be ok! Remember you are the all powerful Fabulous Lorraine. You can handle this. You might not be able to fix it, but you can handle it. Yes, you are not the vet you are not the expert - how do you even know what you want to do until someone can tell you what is going on? And yes, they need to get that what you want to do is what Cabal needs. Such a hard place to be in, all around. Sending love to all of you. Oh No! Poor Cabal and you Q! Sending so much love your way. Much love & positive thoughts for Cabal, you and all his family. Keeping all fingers & toes crossed that the vets can help him, and soon. Good luck tomorrow! Have a song for the occasion. Oh no, Cabal! Come on, you can do it!! Yes, Cabal, You can do it!! Sending best thoughts to Cabal and his family. Get better soon. Cabal, you are loved. Lorraine, you are loved in return. There is strength to be found in this. My thoughts are with you both, as well as with the Worried, Absent Author. Oh no, poor Cabal, and poor you and Boss! Many healing thoughts. Oh Fods no. Sending much love and strength to you Cabal, Boss and everyone else who loves the big white doofus. Fingers crossed that he will be okay. Let me start by saying this: if you need someone to drive down and spend time with Cabal so that he stays as still as he needs to be, I have a car, I'm in Chicago and am willing to drive down to Minnesota if it means Cabal will get better. I lost a rescued dog recently (long story) and if I can help another I'm more than willing to do so. That being said, I know there's no reason to accept help from a random internets stranger so here's the other tip I have that I hope will help. Our dog is terrified of thunderstorms and, if left alone when one arrives, can get destructive to property and himself. Our vet prescribed acepromazine, which keeps him calm but also slows him down and keeps him still. Maybe it would do the same for Cabal? Also forgot to add: while I now have an iPhone I used to have a Blackberry for a long while. I also work as an IT geek, so if you get desperate you can ping me at chaselton AT gmail DOT com. Holding my thumbs for Cabal. Healing wishes for poor Cabal and astral comforting hugs to Cabals loved ones. Too bad they don't have Chiropractors’ for dogs. One of our cats had an inflamed disc a few years ago. She was right as rain after a couple of weeks of rest, which mostly involved keeping her in a quiet room so the other cats couldn't torment her. I hope your Cabal has the same quick and easy recovery. Try chiropractic intervention, it really is fantastic and may help him avoid surgery, which will doubtless compound the issue. Poor Cabal. Hope he's feeling better soon. He looks such a bright character. Have popped a link below regarding chiropractics for animals, just so you can have a butchers, see what you think.